Toolset, one of the most powerful WordPress plugin suite, with a much expected tweak is all set to be mightier than ever with its new avatar. I was recently notified by the company about their upcoming drag-and-drop form builder. Wow. Finally we’re going to have it. Toolset Forms (formerly CRED), an exhaustive and indispensable plugin, has up until now lacked a drag-and-drop form builder and users have been demanding it desperately. Toolset Forms needs no introduction and every person who has anything to do with WordPress knows it as a vastly advanced WordPress plugin and, among other things, can be used to create custom data collection forms for custom post types such as WooCommerce products, custom real estate listing forms, classified directory listings, user registrations etc. With Toolset CRED, we can collect as much data as we want related to a post type. We can pick custom field data, WordPress default taxonomies, custom taxonomies and, believe it or not, add even non-WordPress fields (generic fields) in a collection form. Create custom forms to collect data of literally any type like user, real-estate, city directory, student directory, exam results, football team management, staff management, car wash booking, appointment booking etc. with limitless customization. In its present form, Toolset Forms comes with a free style HTML/CSS editor to generate forms for posts, which undeniably for all practical purposes offers full freedom to build form layouts and create forms in all possible ways. But the thing is that except for experts, people generally like a drag-and-drop form builder that makes them feel more at home in creating a form with a layout of their choice. Toolset team finally addressed users’ concern and, voila, the long wait is at last going to be over very soon. 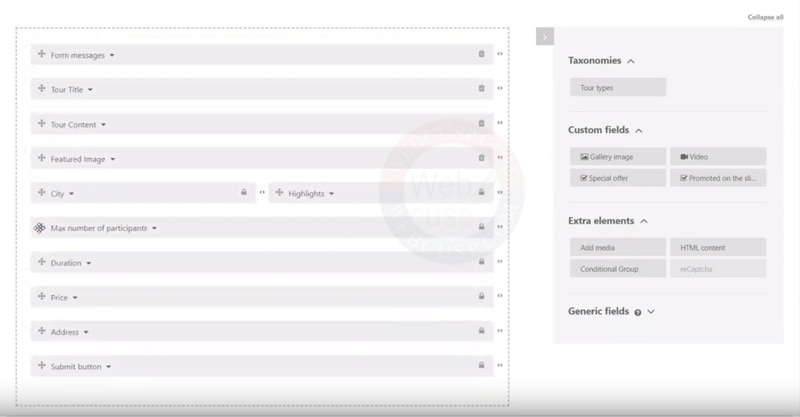 They have shared a video with me and the new form builder demo seems for all obvious reasons to be genuinely promising. 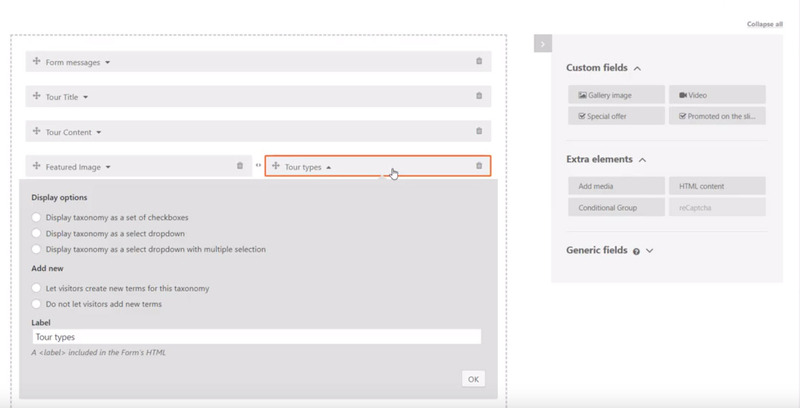 In the new form builder we can create multi-column forms, drag and reposition forms and adjust options related to a field directly from the form builder canvas. 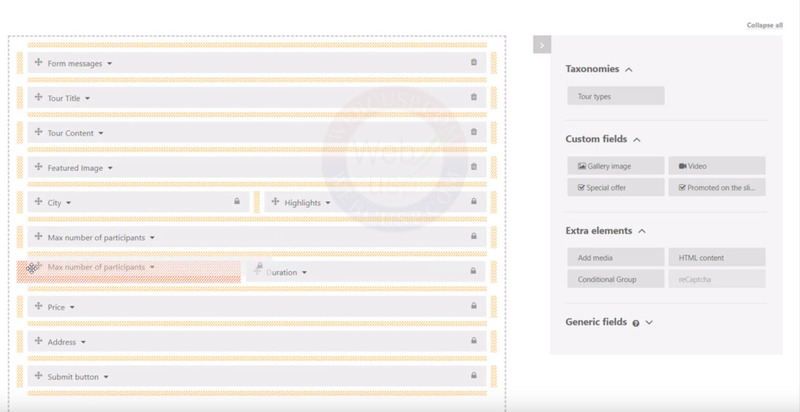 All custom fields, taxonomies attached to the post type we select for the form, are shown in a builder sidebar. Additionally, some display-only fields like ‘featured image” are also available. It is worth mentioning here that the old form builder (expert mode) will also remain available for users and we can switch between expert mode and drag-and-drop mode at any time during form creation.